Zip Code: Retains any leading zeros in the value (important for zip codes and of absolutely no importance in arithmetic computations). Example: 05497. Zip Code + 4: Automatically separates the first five digits from the last four digits with a hyphen, and retains any leading zeros. Example: 05497-5555. Phone Number: Automatically encloses the first three digits of the number in parentheses and separates the last four digits from the previous three with a hyphen. Example: (999) 555-1111. Social Security Number: Automatically puts hyphens in the value to separate its digits into groups of three, two, and four. Example: 555-00-9999. In the Category list, select Special. The available special formats appear in the Type list. 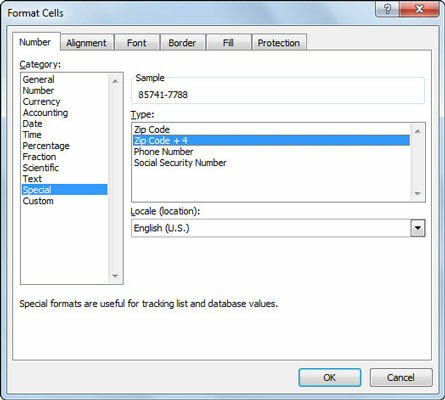 Use the Format Cells dialog box to apply Special formats such as Zip Code and Phone Number. Select the desired format from the Type list. When you click a format in the Type list, Excel shows what effect this would have on the first of the values in the current cell selection in the Sample area above the Type list. Excel applies the format to the cell selection.